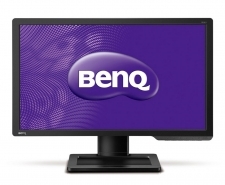 Built for the Ultimate Victory, the BenQ XL Series puts you in Control of Your Destiny. With the precision and speed you would expect from a high-performance gaming monitor, you can now have a vantage point over your opponents in all your game play. The Display Mode and Smart Scaling features allow you to change the monitor view to suit your liking and to simulate any in-game experience. Interchange instantly between different screen sizes , from 17" (4:3), 19" (4:3), 19"W (16:10), 21.5"W (16:9), 22"W (16:10), 23"W (16:9) to 24"W (16:9), using the Display Mode. Or take advantage of the Smart Scaling feature and enjoy the flexibility to freely scale the screen content to any custom size.